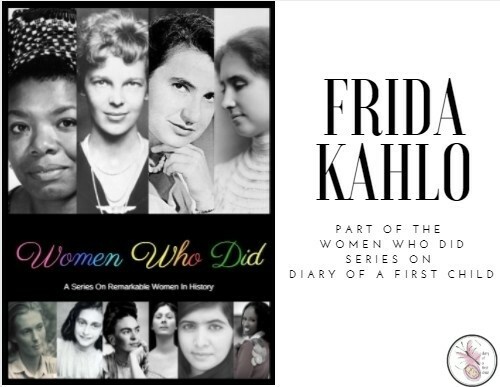 Continuing our theme “Women Who Did” for this year, our second amazing woman from history is Frida Kahlo, the Mexican painter who suffered and survived not only childhood Polio, but also a bus accident that left her in a full body cast and bed ridden for two years. Despite spending the rest of her life in constant pain, Frida lived that life abundantly, boldly, and with an enviable strength. Who Was Frida Kahlo? – A book by Sarah Fabiny and part of the Who Was series, this is a great little book. It’s longer than a normal kids book, but shorter than a regular chapter book. 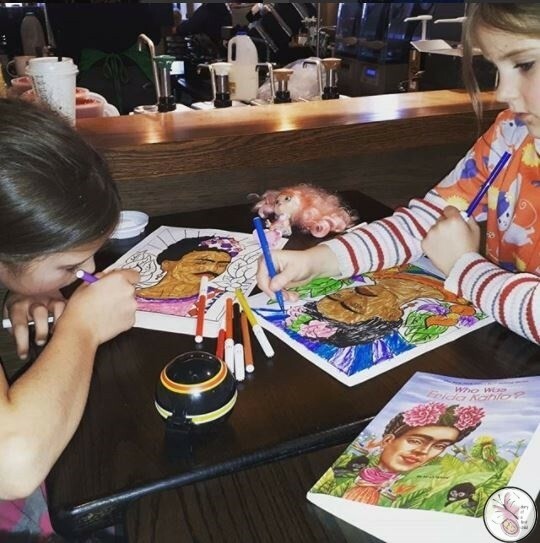 It took a little over an hour to read out loud to the kids, sitting in Starbucks sipping hot chocolate and colouring pictures. 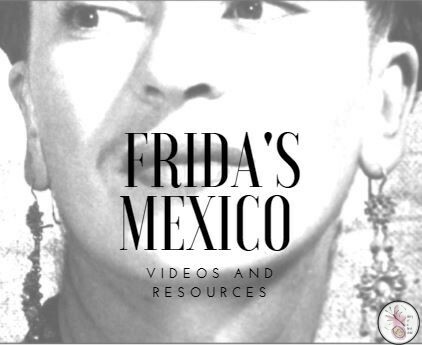 Who Was Frida Kahlo starts with a brief overview of the artist, then starts at the beginning, talking about her childhood, contracting polio, and the terrible accident that affected her for the rest of the life. It talks about her as a child in school, and a young adult, and goes on to discuss her relationship with Diego Ravera – whom she married, divorced, and remarried. The book deals with some pretty heavy topics: illness, accident, inability to have children, divorce, separation, but it also shows what makes Frida Kahlo a woman of note. She overcame incredible odds, showed amazing perseverance, strength, the ability to carry on despite everything that happened. It also shows how she was strong enough to do new things on her own, and how, despite her fame and mixing in important circles, never lost sight of the lives of average people. It also shows how she kept true to her own roots, and valued where she came from. 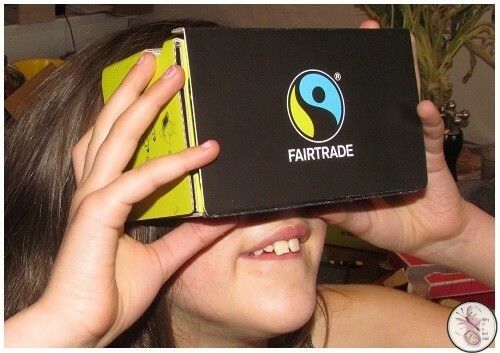 These are valuable lessons to teach young women with big dreams. The Heroines Club focuses on healthy expression for this theme, with the slogan “I Express My Feelings In Healthy Ways” and a really good self portrait that includes our feelings and emotions in the head and heart space. Fortunately my girls like bold and bright colours, so finding something in their wardrobe that suited the Frida Kahlo theme – even just loosely – was easy enough. 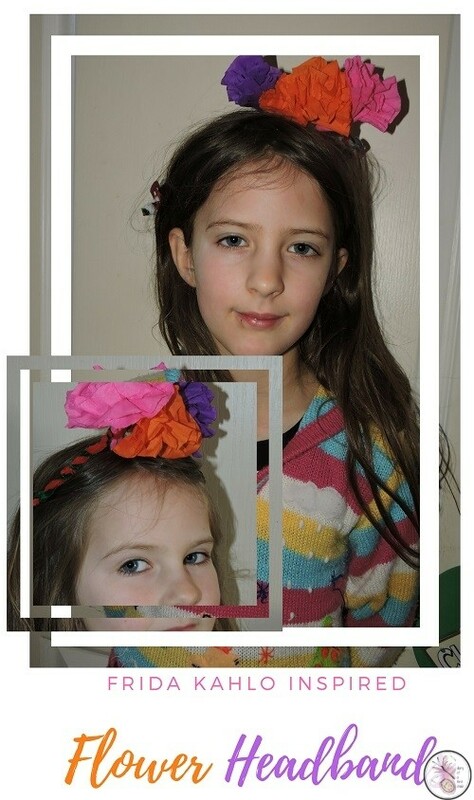 Making the headbands to match was fun and really “popped” the look. 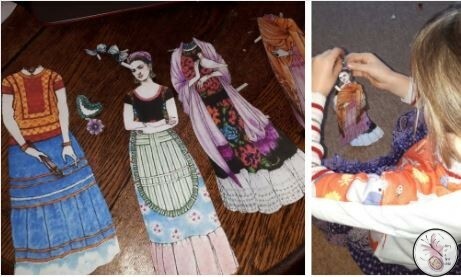 If you can’t dress up like Frida Kahlo there’s a fab looking magnetic dress up wardrobe but we also found printable paper Frida Kahlo dolls that you can cut out and use for imaginative play. I printed out two dolls so both girls could play at the same time. 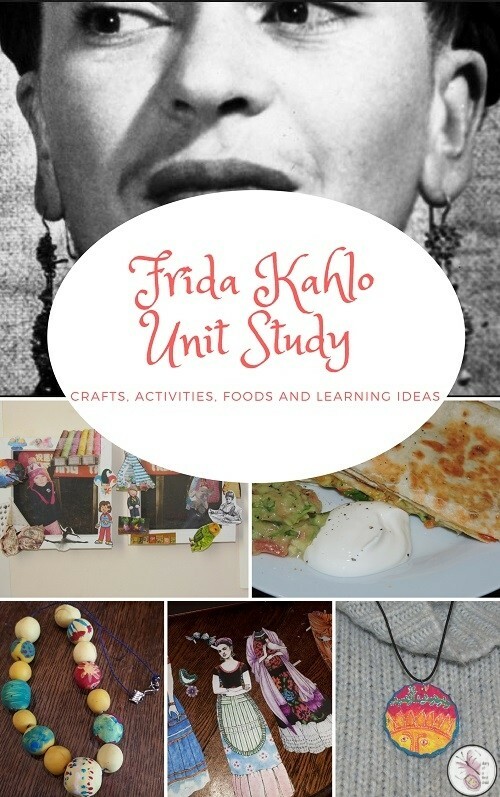 A theme about an artist kind of needs some creative activities to it, I’d say, so we used Frida Kahlo as an inspiration for making paper or felt flowers to turn into DIY headbands – which fits in with Frida Kahlo fancy dress too. 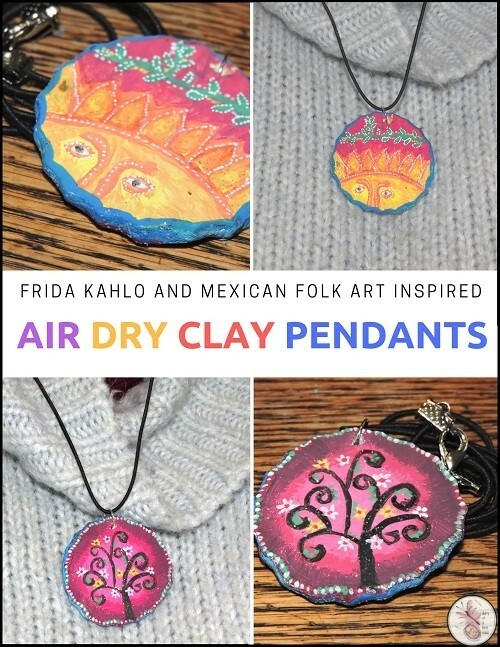 Along with that I thought some jewellery design would fit in perfectly – we made bright and bold pendants, and then used beads to make Frida Kahlo style jewellery. With the help of an artist friend, Donna Jones MBE, we also focused on self-portraits, surrealism and other ‘about me’ crafts including our shadow boxes. This fun art project is based on Frida’s “The Frame” – a self portrait of Frida with a blue background painted on a sheet of aluminum while the boarder of birds and flowers is painted on the back side of a glass that lays on top of the portrait. This portrait encompasses some of the things that make up the ‘who’ of Frida Kahlo, with the blue of her childhood (and parts of her adult) home, and her pets completing the image. We decided to do a similar thing with shadow boxes, so the girls had to think about the things that ‘make me, me’ and create their boxes accordingly. In my dreams I’m able to pop on my private jet and pay a visit to anywhere at any time, but sadly my private jet lives only in my dreams, so a good alternative for visiting Frida Kahlo’s house is an online tour of the Blue House. Frida Kahlo was a great ambassador for Mexico. Even though she travelled to other countries and was from the upper classes of society, she always dressed in the peasant outfits of her country, rather than adapting to local styles. Diego Reviera’s daughter from his first marriage lived with Frida for some of their relationship, and she co-authored a book about Frida and food. 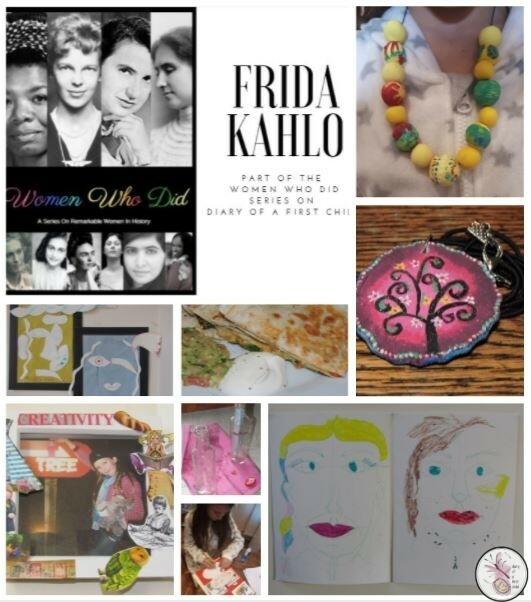 The book, Frida’s Fiesta says “For Frida, every occasion was a cause for rejoicing. She met each holiday, birthday or religious observance with enthusiasm. Her style of cooking and entertaining, as detailed in Rivera’s cookbook, was as vibrant and colorful as her painting.” I’d hardly expect anything less from such a vibrant person. There are tons of Mexican meal options that you can make while learning about Mexico and Frida Kahlo, but since we’re not big consumers of legumes or chilli, we had to be a bit more “Western” in our “Mexican food” choices. 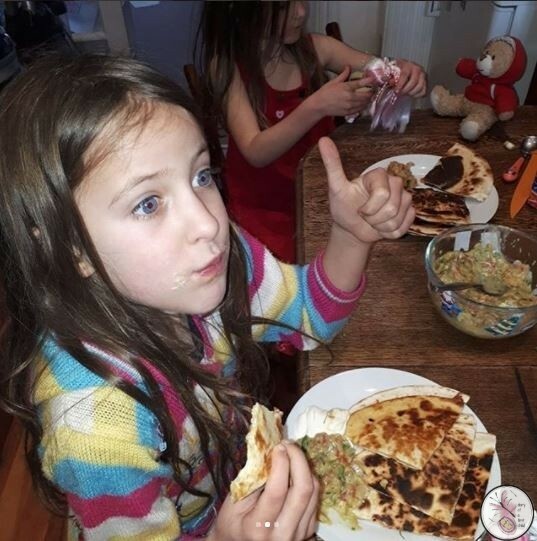 As such, I made Quesadilla, Taco and Nacho recipe cards for the girls to cook from. And finally, as part of a wider learning agenda, we focused for a while on Mexico, learning about the country, the landmarks, and other aspects of Mexico.